LOS ANGELES (AP) — Hyla Merin grew up without a father and for a long time never knew why. Her mother never spoke about the Army officer who died before Hyla was born. The scraps of information she gathered from other relatives were hazy: 2nd Lt. Hyman Markel was a rabbi's son, brilliant at mathematics, the brave winner of a Purple Heart who died sometime in 1945. But on Sunday, decades after he won it, Merin received her father's Purple Heart, along with a Silver Star she never knew he'd won and a half-dozen other medals. "It just confirms what a great man he was," Merin said tearfully. "He gave up his life for our country and our freedom. I'll put it up in my house as a memorial to him and to those who served." Merin's mother, Celia, married Markel in 1941 when he already was in the military. They met at a Jewish temple in Buffalo, N.Y.
About four months ago, the manager of a West Hollywood apartment building where Merin's mother lived in the 1960s found a box containing papers and the Purple Heart while cleaning out some lockers in the laundry room, Merin said. She became "kind of emotional, because I don't have a lot of pictures, I don't have a lot of stories, and I've always been a crier," she said. "My mother was always the stoic one, very strong." Markel was killed in the last days of World War II on May 3, 1945, in Italy's Po Valley while fighting German troops as an officer with the 88th Division of the 351st Infantry Regiment, said Zachariah Fike, the Vermont Army National Guard captain who founded Purple Hearts Reunited. 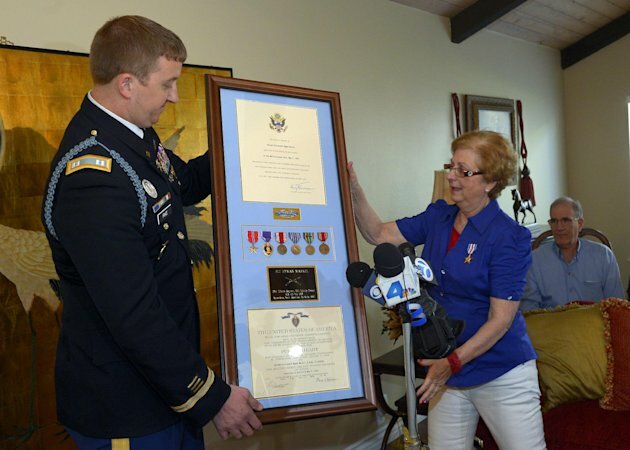 "The accounts suggest that he was out on patrol and he got ambushed and he charged ahead and basically took out a machine gun position to save the rest of his guys," said Fike, whose organization has returned some two dozen medals. "For that, he paid the ultimate sacrifice." He was awarded the Purple Heart and Silver Star posthumously, but for some reason the family never was told about the Silver Star and it was never sent to them, Fike said. Merin's mother never talked in detail to her daughter about Markel. "It was a very difficult topic for her. When my father died, she was seven months pregnant with me," Merin said. Her mother briefly remarried when Merin was 10 but her stepfather died three years later, Merin said. Her mother moved into the apartment in 1960 and may have placed the Purple Heart in the locker then, Merin said. Her mother lived there until 1975 before moving away, and Merin's aunt lived there until 2005. Another aunt lived there until 2009. They never spoke about what was in the locker, and the family must have missed the box when they took away the aunts' possessions in 2005 and 2009, Merin said. Merin said that in addition to the Purple Heart, which Pike kept for framing, the box contained letters and other papers, and her father's Jewish prayer book. "I found it very hard to look at. A lot of them were condolence letters," she said. Merin's mother was told about the discovery of the Purple Heart but didn't live to see it — she died Feb. 1 at age 94.